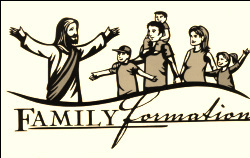 As part of our movement towards Whole Community Catechesis, St. Margaret Mary Alcoque Parish Faith Formation has implemented a parent component for all of our youth faith formation programs. What does this mean? Now, instead of just your children receiving faith formation, you, too, will meet with other parents and share faith, grow in knowledge of church traditions and values and, most importantly, foster community. Parent Faith Formation attendance is a requirement for all parents/guardians of children in the Elementary, Jr. High and Confirmation Faith Formation (RE) Programs.